Broken links (also called dead links) are quite often found on websites, because pages move, are renamed or there is just a typo within the link. The result are errors with the status code 404 - "not found". This is quite annoying for your visitors and - depending on the content they were looking for - can even mean that you loose the visitors. Besides that search engines as well do not like 404 errors. The bot crawls your Joomla! website and if it has a lot of broken links it may be read as a sign that your website is not up to date and maybe no longer maintained. As a result you risk to be rated worse so your website may loose ranking. Therefore we recommend to find and fix your broken links. To detect dead links on your Joomla! website, you can use a broken link checker. There are a couple of online tools you can use. A list of good tools can for example be found here. Alternatively there are some Joomla! extensions that can help. Have a look at the JED. 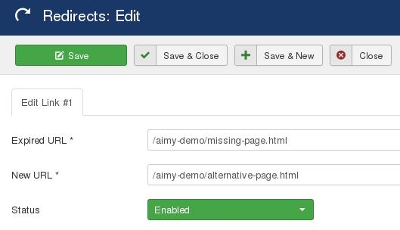 If you care about SEO and want to create a sitemap we have good news: Since version 3.19.x Aimy Sitemap PRO also provides a report on broken links. In this case you do not need an extra extension to find your dead links. All broken links are listed along with the page the link was found on. This way fixing broken links is quite comfortable. Additionally, a sitemap sums up all current web pages of your Joomla! website so it minimizes the problem that pages that no longer exist are found in Google SERPs. If you have found broken links on your website, fix them. If a page has just moved, repair the link path accordingly. If the page linked to does no longer exist you can either delete the link or find a replacement. Alternatively have a look at Joomla!s Redirect Manager. Here you can set new or alternative URLs for expired URLs. This way you do not have to look for all pages that link to the site but manage the destination URL once. To use Joomla! 's redirects, enable the plugin "System - Redirects" first. Then got to Components - Redirects and add a new. After repairing all broken links, use the link checker again to see if all broken links have been successfully repaired. If you use Aimy Sitemap PRO anyway, you will automatically be reminded during each crawl. Even if you use a link checker regularly - there may be errors in the meanwhile. To give a good sign to search enginges and vistors, prepare an indiviual 404 error page. This way it is less annoying and you minimize the risk to loose your visitors.